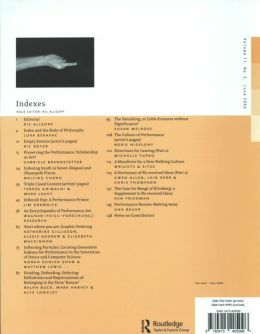 An issue on the nature of the index as a form, as an operation to be performed, as an ordering relation, a repertoire or register, rubric or catalogue. An issue that explores the use of indexes as a means of recording and generating through alphabetic, numerical or colour schemas; or through measurement, linking, adjustment, tracking and navigation. 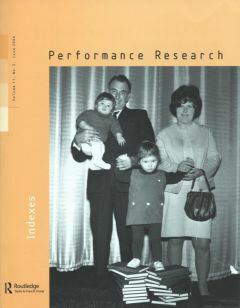 An issue that explores what indexes can tell us about the textual and performance forms that they relate to, explores their use as something visible, evident or revelatory that gives grounds for believing in the existence or presence of something else. An issue that looks into the index as a means of restriction or censorship of particular readings or performances, or organizes the terms under which performance is debated, discussed, conducted, written about and constructed. The Vanishing, or Little Erasures without Significance?